Katie Youngs earned a B.S. degree in Environmental Technology from North Carolina State University in December, 2010. 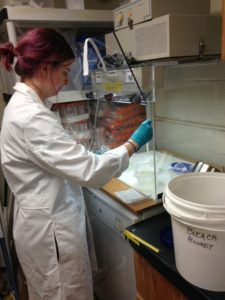 Prior to graduation she worked as a research technician in the Steve Frank Ornamental Entomology laboratory at North Carolina State University. During her time in the Frank lab she studied the effect of manual and airblast insecticide applications on natural enemy abundance and diversity. August 2013 Katie earned a Masters degree in Entomology at North Carolina State University under adviser Yasmin Cardoza. Her M.S. research focuses on evaluating host plant resistance in turfgrass against the southern chinch bug.